Londoners like their coffee, tea, and alcohol. This provides London with a range of rooftop bars, historic pubs, cafés, tea rooms, and coffee shops to visit. We recognize that London has a whole lot more than drinks to offer… so for that info, you can scroll down to the bottom. For places to get caffeinated or intoxicated… read on. Voyalific has put together a comprehensive list of places which serve some of London’s best. First Step — Get Caffeinated. Located in the heart of colourful Earls Court, it is the perfect spot for quality coffee and food. The staff is incredibly friendly and happy to make delicious coffee creations. Within a matcha latte, Over Under has a signature ‘Shot of Delight’ which takes your drink to the next level. This Café is just gorgeous, from the signage outside, to the lights, to the wooden tables, to the details in the washroom, it is perfection. It comes with incredible service, a lively atmosphere, and delicious coffee made with the beans roasted in house. It opens at 8am, and the early light shines through the glass ceiling into the cafe to calm down any customers who have yet to have their coffee. Perfect breakfast spot just around the corner from Sanderson Hotel and the Berners Tavern. Serves French pastries, fruit, tea (from real tea leaves), and delicious coffee. The restaurant has great energy, an extensive menu, and strong coffee. It is a must visit for a true coffee lover in this part of London. London photographer @elice_f took advantage of Britain’s recent Cycle to Work Day when we gave her the Detroit Arrow for the day. She stopped for a cup at @kaffeinelondon to enjoy the view. This place is a very interesting combination of bike shop, cafe, bar, restaurant, and writer hangout – aka a hipster haven. Find a seat, order at the counter, and they bring it to you. Fresh, hot, and delicious food with a wide selection of beer to choose from. 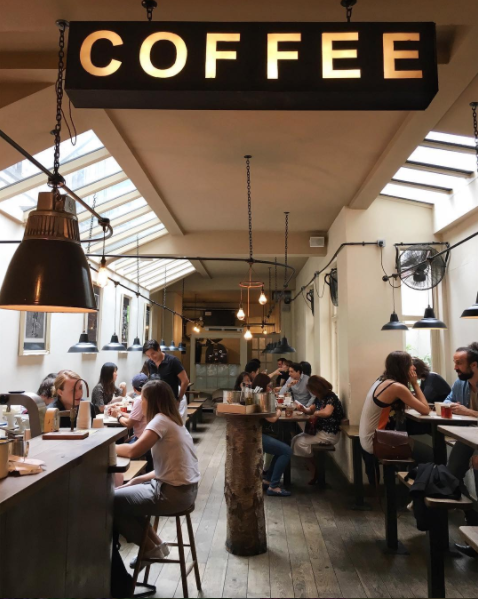 This place is so diverse, it is where you can find one of the best burgers in London, taste delicious scrambled eggs for brunch, great coffee, and biking enthusiasts galore. During the Tour de France, you could enjoy a nice lunch while watching it on a big screen. Although it largely attracts cyclists, you don’t have to be one to enjoy the food, drinks, and atmosphere. London seems to be crawling with bike/cycle cafés, so we had to feature this one too. This location allows you to park your bike in the back yard of the shop, and pick up any bike essentials like inner tubes, lights and smaller accessories you may need. The mechanics are efficient, full of advice, and well priced. Being very close to the new Quietway 1, Deptford Bridge DLR, and the Deptford Rail stations, it is easily accessible and is also the perfect spot to have a quiet read during the daytime, or have a quick break from the London hustle. This is the place to stop in for a nice brunch, and get your bike serviced while you’re there. This is a popular location amongst University students from SOAS, UCL, and University of London. Menu features a large choice of cakes and coffees, with selections of avocado toast, gluten free bread, bacon and eggs. Super cozy to pick up coffee and breakfast to enjoy on the outdoor patio before exploring the city. My pants fit a little differently after this week and I'm okay with that. Brunch spot with delicious coffee and a serene setting. The granola is described as heavenly – it must have at least a dozen different ingredients, including dry glazed slices of oranges, bloody grapefruit pieces with tenderest goat cheese and creamy light yogurt – all generously draped in maple syrup and sprinkled with pollen. Not having it for a Sunday treat would be a disappointment! Expect utterly delicious, freshly cooked meals and show up early! Little Café just off Strand on the Green if you’re walking along the river. It provides indoor and outdoor seating in the front and back. It has a great atmosphere, delicious coffee and cakes, amazing staff and a chilled vibe. Best coffee in west London, made by kind and friendly owners who are invested in the community they serve. Great decor, fresh made food, travellers from all over the world and smiles galore. Stop in for ice cream and iced coffee to beat the heat! Also see Holborn Grind, and Shoreditch Grind. Serving diverse, fresh, and delicious food to pair with their divine selection of teas. Found in London’s financial district, it is the perfect venue to enjoy the British tradition of a perfect cup of afternoon tea. Good quality and reasonably priced, with an extensive variety of teas, beautiful crockery and seating arrangements. You choose from a fish option, meat or vegetarian and then you can add 2 – 4 salads from the list below, outstanding value, and good service. Modern twist on a traditional afternoon tea. You are provided with a choice of tea, and a choice of two options from a hot menu as well as your flavoured scones, sandwiches, and desserts. Great tea, food, atmosphere, and friendly staff. Elegant tea room, just off Oxford Street, is the perfect place to escape the shopping crowds and enjoy a lovely “very British” meal. A beautiful, bright, location in Kensington Palace with a fancy feel – perfect for afternoon tea. Extensive options of tea, delicious tea sandwiches, scones, and desserts. Great place to start out your day of touring the Royal Landmarks in the city, as the Orangery also serves a wonderful breakfast menu. You may enjoy the grounds before or after tea, walking along Hyde Park to Buckingham Palace and Westminster Abbey. We recommend making a reservation for afternoon tea – it’s popular. A classic and historical pub with plenty of ol’ fashion character. Featuring vintage decor, a garden space, and a rooftop with a view. It’s a local watering hole that serves some great food too. You can probably just look at the attached photo and decide you want to visit this rooftop; complete with lights, views, and booze. Location is amazing, staff is very professional, good sized portions, and incredible atmosphere. This isn’t only a nighttime party place. You can get fired up at brunch at Brooksby’s walk with a delicious menu and lovely fruity drinks. The owners wait tables themselves, and interact with as many customers as they can. It is a comfortable and relaxed atmosphere at any time of day, where you can really chill out whether your day is beginning or ending. Mexican food and drinks with a street food feel. There is a wide variety and choice on the menu with an extensive selection of drinks to choose from as well. It plays loud music, is always bustling, and the menu items are made to share with a group. Great food, nice beer, fun atmosphere, and friendly staff. Vegetarian platter available *. It’s central location makes it easy to get to and it’s pub-ish feel makes it a perfect spot for an ethical happy hour. This place is as locally sourced as they come – with a menu changing regularly to keep things fresh and in season. They serve local beers, the vegetables grown in their rooftop garden, and their cocktails are seasonally based on the herbs they grow. It is nice and busy but not too busy. Great natural vibes with excellent food – hard to get more local than this place. The team working here has a passion for food that is absolutely infectious. It has bold flavours done with subtlety, making for a very unique experience. Quality and attention to detail is evident in every dish served. The social club has wonderful wine and drinks that are well priced. Now that you are caffeinated you can go see the rest of the sights London has to offer! If you’re intoxicated… maybe sleep it off and get some coffee before venturing to any museums. Or just stay at the pub… we get it.